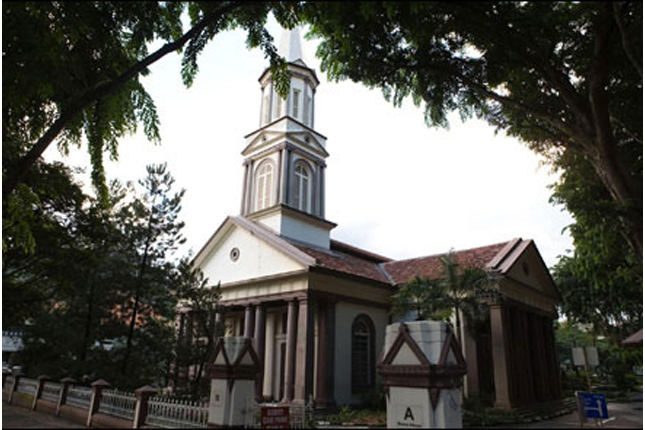 The Cathedral of the Good Shepherd is one of Singapore's oldest Catholic place of worship and the seat of the local Roman Catholic archbishop. 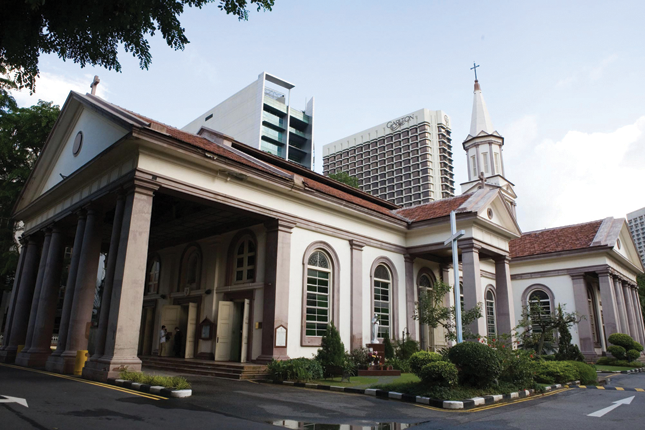 Not only does it bear testimony to the spread of Catholicism in the region, the edifice also serves as a reminder to the contributions of early Catholic missionaries to the fields of religion, architecture, and education in Singapore. 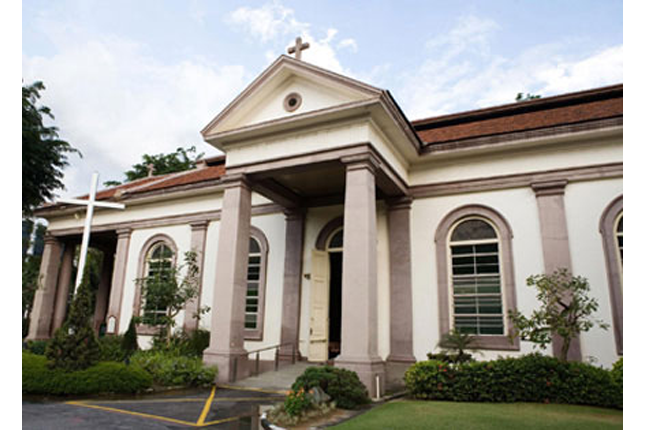 The history of the Catholic Church in Singapore began soon after Singapore was established as a British trading port in 1819, when European Catholics arrived on the island. These early Catholic pioneers worshipped in private homes until a small chapel made of wood and attap was erected on the site of the Former Saint Joseph’s Institution. The chapel soon proved to be too small for the rapidly expanding Catholic congregation. Reverend Father Jean-Marie Beurel, a priest from the Society of Foreign Missions of Paris (MEP), successfully obtained a plot of land from the government to build a brick-and-mortar church. A subscription drive was launched to raise funds for the building project. Donations streamed in from both the local Catholic community as well as Catholics abroad. The latter included Maria Amalia of Naples and Sicily who was then the Queen of France, and the Irish Archbishop of Manila Michael J. O’Doherty. 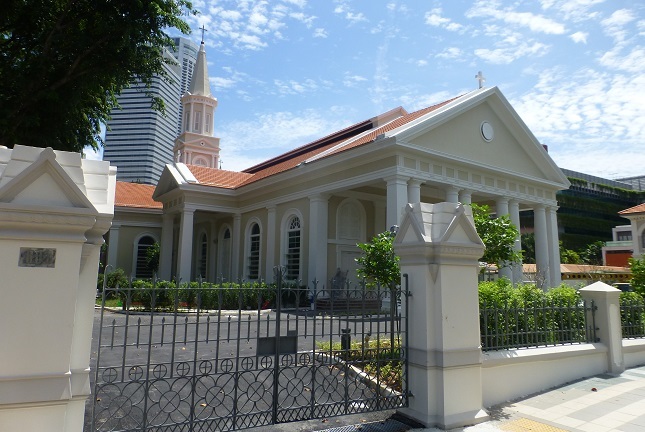 The construction of the first permanent Catholic place of worship in Singapore commenced with the laying of the foundation stone on 18 June 1843. Father Beurel blessed the newly completed church on 6 June 1847. Prior to the construction of other Catholic churches in the vicinity, such as the Church of Saints Peter and Paul and the Church of Our Lady of Lourdes, Catholics from different races congregated and worshipped in the Church of the Good Shepherd. On 14 February 1897, the church was consecrated by Bishop of Malacca René M. M. Fée, MEP, and elevated to the status of a cathedral. Besides overseeing the church’s construction, Father Beurel was also instrumental in the establishment of two mission schools in Singapore. Under the instruction of the Penang-based Vicar of Malaya Bishop Jean-Baptiste Boucho, MEP, Father Beurel visited Paris, France, in 1851 to recruit teachers to set up new mission schools in Malaya. He successfully sought help from two teaching congregations: the Institute of the Brothers of the Christian Schools (or simply the Christian Brothers) and the Congregation of the Holy Infant Jesus (CHIJ, or the Dames of Saint Maur). They went on to found Saint Joseph’s Institution and the Convent of the Holy Infant Jesus in Singapore respectively. The dedication of the church to the Good Shepherd, a depiction of Jesus Christ in the Gospel, has been attributed to an MEP bishop-martyr, Saint Laurent-Joseph-Marius Imbert. It is believed that Father (and later, Bishop) Imbert was the first Catholic priest to offer Holy Mass in Singapore, when he was en route to Joseon (today's Korea). During the persecution of Catholics in Joseon, Bishop Imbert was betrayed and arrested by the local authorities. He penned a note to his fellow priests shortly before his martyrdom to encourage them to surrender themselves to the officials, so as to prevent the extermination of the Korean Catholic population. The note read, ‘In desperate circumstances, the good shepherd lays down his life for his sheep.’ He was beheaded in 1839. When news of the Korean martyrs reached Singapore, it inspired Bishop Boucho and Father Beurel to name the newly built church after the Good Shepherd. Together with the other Korean martyrs, Bishop Imbert was canonised by the Catholic Church in 1984. His relics are enshrined in the Cathedral of the Good Shepherd today. Designed by Denis L. McSwiney, the present church edifice takes the form of a Latin cross. The architecture was inspired by two well-known churches in London, which were in turn modelled after Classical temples. While the cathedral adopted the Roman Tuscan features of Saint Paul’s Church (commonly known as the Actors’ Church) in Covent Garden, it derived its temple-like proportions and design of the belfry from Saint Martin-in-the-Fields at Trafalgar Square. Tuscan columns surround the perimeters of the church building. Above the entrance doors and windows of the cathedral are beautiful stained-glass panels, including one that depicts the Madonna and Child, and another, Saint Joseph. 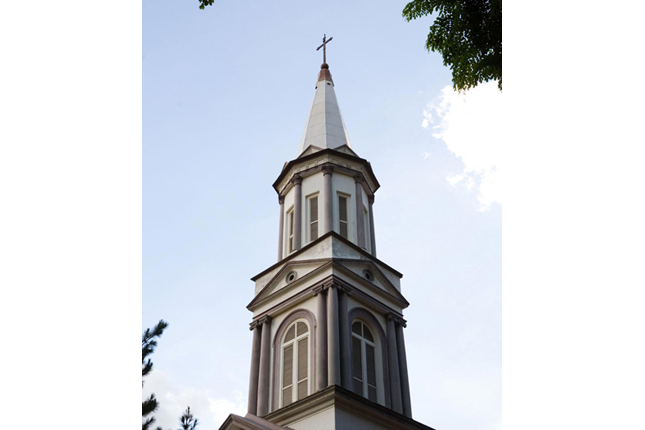 The church steeple was erected in 1847, following the design of Charles A. Dyce, a renowned Scottish artist. It has three distinct sections: a rectangular cuboid base, an octagonal mid-section, and a six-sided conical top. A budded cross surmounts the steeple. Inside, the centrepiece of the sanctuary is a large crucifix hanging against a mosaic backdrop of rays radiating from the corpus of Jesus. This is framed by twin pilasters on the sides and a triangular pediment above. On each side of the sanctuary are doors leading to the sacristy, where sacred vessels and vestments used for divine worship are kept. The timber ceiling is decorated with rectangular and circular patterns. Twelve crosses engraved on marble slabs can be found on the interior walls of the church: they were mounted and anointed by the bishop when the ecclesiastical building was consecrated. Numerous large windows around the church ensure that the interior is well ventilated. The pipe organ in the cathedral’s choir loft was installed by Bevington & Sons of London in 1912 and is Singapore’s oldest playable pipe organ. Within the cathedral grounds are also the Archbishop’s House and the Priests’ Residence. The Cathedral of the Good Shepherd underwent a 3-year major restoration project and reopened on 20 November 2016. Today, the cathedral continues to serve both the local and migrant Roman Catholic communities.